Anyone who knows us well will tell you that for years we have had a dream of sailing off to explore new places and to escape the New York winters on a cruising sailboat. We’re pleased to announce that we just took a huge step toward making that dream a reality with the purchase of a sailing catamaran! The dream of doing long range cruising had been sort of put on the back burner for a few years. We were taking care of Cindy’s mother who suffered from Alzheimer’s which made it very difficult to take a vacation, nonetheless sail away for weeks or months at a time. When her mother sadly passed away last September, there was suddenly one less excuse to not do it now. As small business owners we can effectively work from anywhere we have solid internet service. And as cellular data coverage has been steadily improving over the years, the places we can work from have increased pretty dramatically. So there’s another excuse shot down. Then, of course, there’s finances. Purchasing, maintaining, and running a cruising boat is not an inexpensive undertaking. I had been searching and fantasizing for years looking at all sorts of boats. Monohulls, catamarans, even trawlers and tugs. Cindy really doesn’t like the way monohull sailboats heel when underway. We sailed a Catalina 25 together for many years and I agree that cruising on a 10 to 25 degree bank gets old. We both really love the interior space and flat-sailing that catamarans offered… But they’re pretty expensive. We had catamaran dreams and a modest monohull budget. 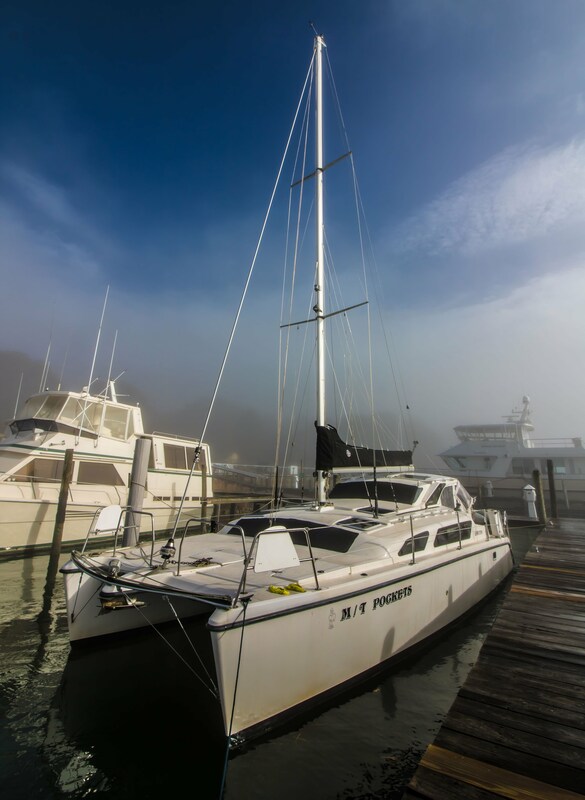 Our dream cats are the Fountaine Pajots, Leopards and Lagoons in the 40 to 44 foot range. Not only are these quite expensive to purchase, but operating them would be out of our budget unless we sold everything… And we’re not quite ready to abandon land life entirely just yet. I had discovered, in my internet searches a small catamaran called a Gemini, with their most popular model being the Gemini 105mc. 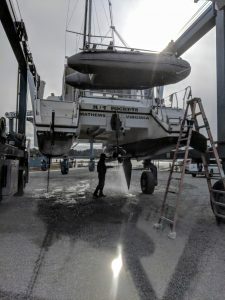 These little 34’ cats featured a single diesel engine, shallow draft (as little as 18” with the boards and rudders up) and a narrow beam by catamaran standards of just 14’ which means they fit in most normal marina slips. Inside are three staterooms, a large airy salon and a full head with shower. The master stateroom features a queen sized bed, a deep closet and lots of drawers. The aft staterooms are a little snug but two people can definitely sleep in them… if they really like each other. It was late fall and my plan was to find a boat down in Florida, purchase her over the winter, stay on board getting her shaken down and then to sail her back home in the spring. I had found a number of boats to look at and was about to head down to Miami when I came across a listing in Virginia. It was for a boat a few years older than the ones I was looking at but the price was right. So on a whim, Cindy and I hopped into our car on her birthday, December 17 and drove 8 hours south to Matthews, Va to check her out. What we found was basically what I expected. We had looked at number of these boats and this one was pretty much the same. It had about 800 hours on the diesel and had some gel coat spider cracks which the Gemini is notorious for. There was no air conditioning but it had the factory cockpit enclosure which was in excellent shape. The interior was clean so we made an offer subject to survey and sea trial. 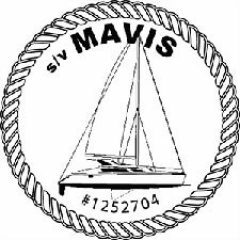 s/v Mavis in the ice at Deltaville Marina. The holidays were upon us so we had to wait until after Christmas for the survey and sea trial and in the days leading up to the big day, the Deltaville VA area experienced record low temperatures which caused many of the creeks and rivers in the area to freeze solid. I was later told the last time this happened was about 40 years ago. Somehow things worked out and we were able to get out on the boat and we concluded our sea trial and survey. The surveyor found a few areas of wet core near the bow and there were a few minor things but no real surprises or show stoppers. We renegotiated the price for the survey findings and sent a wire transfer and just like that. We owned a 2003 Gemini 105mc. Mavis being power washed after haul out. Presently named M/T Pockets (an apt name for just about any boat), she is being recommissioned as s/v Mavis. With the boat about 500 miles away from home, getting the many projects done means a 7 hour drive each way. We have done this a few times already and had her hauled out at Deltaville Boatyard where she will stay on the hard until her launch in early April. 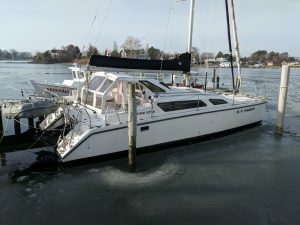 We hope to have her sorted out and shaken down for the sail home in the spring which will take us up almost the entire length of the Chesapeake Bay, through the C&D canal to the Delaware River and Delaware Bay, past Cape May and out into the Atlantic Ocean for the straight shot to Fire Island Inlet. Author Capt. FrankPosted on December 29, 2017 March 18, 2019 Categories Uncategorized1 Comment on We Bought a Boat!